I love Christmas. It is my absolute favourite time of year and I let it be known; I’ve been wearing my Christmas jumpers since the end of October! It is the most wonderful time of year and there is nothing better than cosying up on a cold winter night with a good film. Love Actually is funny, it’s heart-warming and it’s also powerfully real. It effectively manages to capture all the emotions of Christmas from finding love, becoming a capitalist sell-out and the temptations of an affair. Christmas is a time in which human emotions are amplified and Love Actually captures the delicate emotions whilst also upping the ante on them which, to me, is the basis of all good Christmas films. Colin Firth manages to get all the way to France and propose to his housekeeper in Portuguese. The prime minister falls in love with his assistant. A little boy chases his hopefully-girlfriend all the way to the airport. Bill Nighy realises that his agent is his best friend and the bromance is touching. Every aspect of love is dealt with throughout the festive period and the cast is star-studded and spectacular. The film also features Hugh Grant’s iconic dance scene so what’s not to love, actually? The Grinch is one of the most humorous Christmas films out there with Jim Carey playing the Grinch with such comic finesse that you can’t help but laugh all the way through. Yet despite the humorous nature of the film, the reason why it has made it in to my top 5 is Cindy Lou Who’s struggle with Christmas. We’ve all been there, Cindy. We’ve all lost that Christmas feeling whether it was the realisation that Santa isn’t real or that Christmas is basically just one big capitalist extravaganza. But what is so important about the Grinch is that Cindy Lou loves Christmas so much that she does everything she can to get the feeling back. By the time we reach the end of the film and the Grinch has reformed and is singing carols with the Who’s of Whoville, all my faith in Christmas has been restored and that warm fuzzy feeling in my heart won’t disappear until Hogmanay at the earliest. I hate Will Ferrell. Step-brothers is so painfully unfunny, I can’t stomach more than 15 minutes of Blades of Glory and please do not start me on Anchorman. Yet despite my hatred for Will, I absolutely adore Elf. It is hilarious yet also heart-warming. It is also really clever in the way that it takes someone whose whole life is Christmas and transports them into our shallow, consumer-driven society. It also has a really touching love story and a cracking ending and there isn’t a single moment of the film that I don’t enjoy. This decision might seem sacrilegious to “real” film fans but I am absolutely choosing the remake of this film rather than the original. The original black and white film is wonderful, I really do love it, but for me the modern one added a little something extra. I think perhaps it is the stellar performance by Mara Wilson that really gives it the advantage over the original. The idea of our society being so reluctant to believe that Santa Claus gets sent to jail really hits home. Honestly, what would you do if someone thought they were Santa? You’d think they were mad. The most wonderful part of this film is when little Susan overcomes her scepticism to believe in Kris Kringle and all over New York the citizens are wearing badges and hanging up banners which declare their belief in Santa. 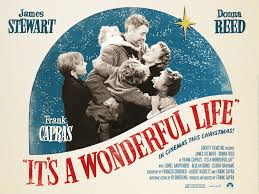 Posted in Arts and tagged christmas, christmas films, elf, it's a wonderful life, love actually, miracle on 34th street, the grinch, top 5. Bookmark the permalink.